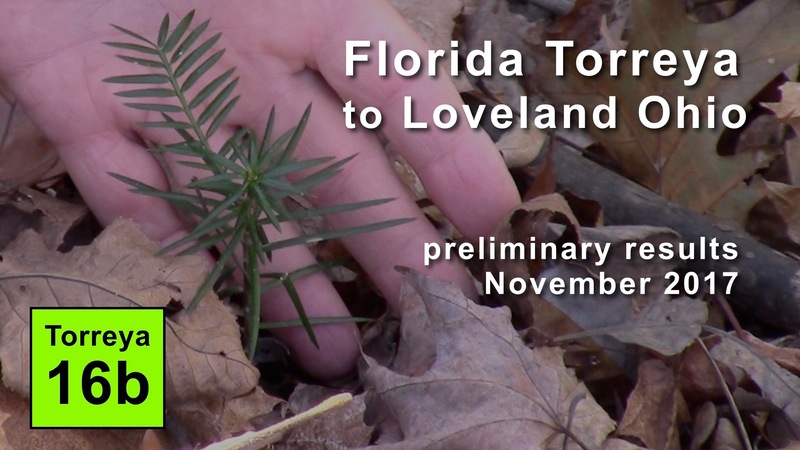 Educational VIDEO series to document the citizen science/naturalist projects of the all-volunteer Torreya Guardians in human-assisted migration of America's most endangered conifer tree, Florida Torreya (Torreya taxifolia), northward in this time of rapid climate change. Note: Videos are numbered and listed in reverse order of posting (newest to oldest). • Newcomers: Begin with VIDEO 21 for an excellent 16-minute OVERVIEW by Lee Barnes. For a lot more detail, begin with VIDEO 1 by Connie Barlow. • Three videos feature GROVES OF MATURE, HEALTHY TREES planted almost a century ago in North Carolina: Biltmore Gardens near Asheville (VIDEO 18), Harbison House near Highlands (VIDEO 11), and Caroline Dormon Nature Preserve in Louisiana (VIDEO 30). Clearly, Torreya taxifolia can thrive well outside its Florida home  and it is far from invasive in recipient ecosystems. 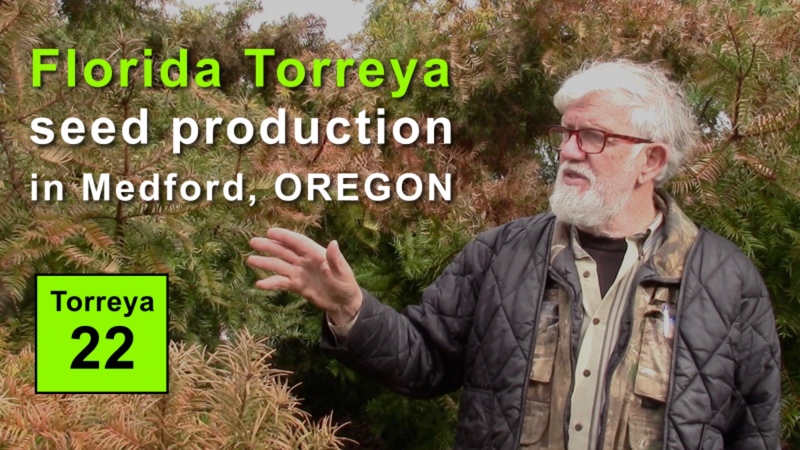 • VIDEO 27 documents FIRST SEED PRODUCTION IN OHIO by a thriving set of dozen-year old torreyas in Cleveland. 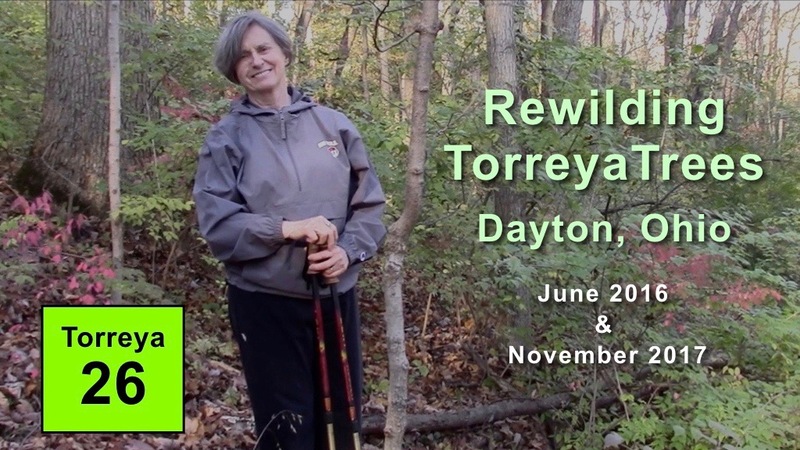 • For volunteers planting seeds directly into forests (skipping the potted stage) two videos are essential: VIDEO 28 shows remarkable RECOVERY FROM RODENT HERBIVORY among the "free-planted" seeds put directly into forest soil 5 summers earlier near Franklin NC. VIDEO 31 (in 2 parts) is the first freeplanting site to evidence zero herbivory of seedlings, 4 years after the seeds were planted: What can we learn from this successful habitat? 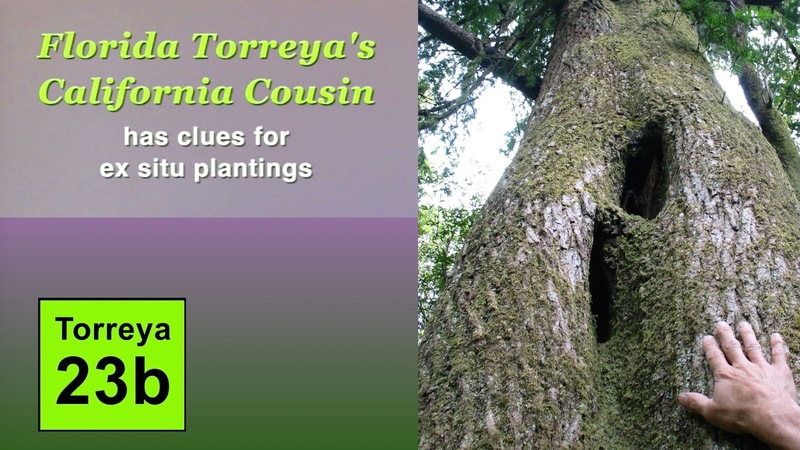 • Take a virtual field trip to wild locales of Florida Torreya's COUSIN IN CALIFORNIA (Torreya californica) via the two parts of VIDEO 23. Here you will see the amazing ways that this patient, subcanopy tree genus awaits its chance (or grows acrobatically sideways) for a spot in the sun. 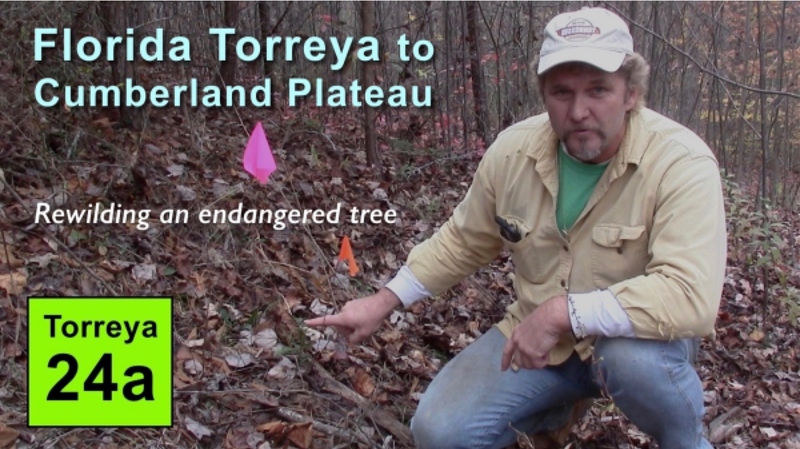 • By far the most expansive and EXCITING EXPERIMENT IN REWILDING Torreya taxifolia into northward states began in November 2015 on the Cumberland Plateau of Tennessee. VIDEO 24 (two parts) documents the first 38 seedlings two years later. All 400 seeds were "free-planted" directly into the ground  either 3 inches deep or under rocks  to protect the seed from rodent predation. Free-planting is an ideal way to give this ancient conifer a chance to establish nurturing relationships with soil fungi right from the start. 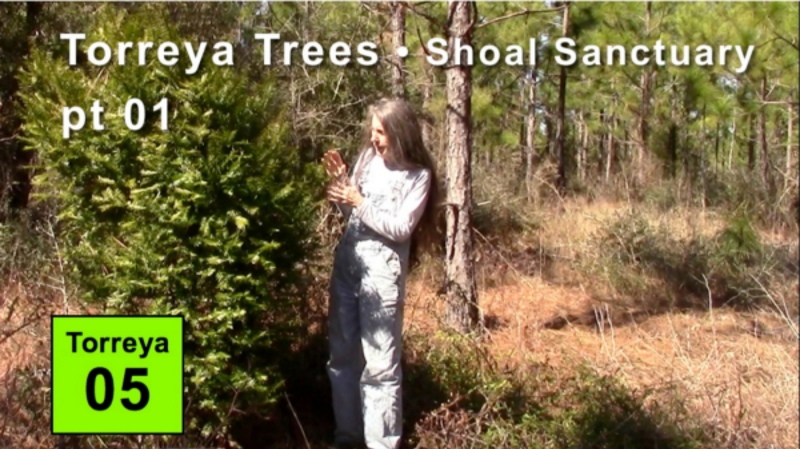 • VIDEO 17 is a site visit to the PEAK GLACIAL REFUGE: Torreya State Park in Florida. The diversity of both temperate and subtropical plant species there signals the crucial role this riverside habitat played when Ice Age cold pushed temperate species south. The remnant Torreya plants regrowing from disease (or replanted from seedlings raised elsewhere) indicate just how impaired this peak-glacial refuge is now for cold-adapted plants in these decades of rapid global warming. 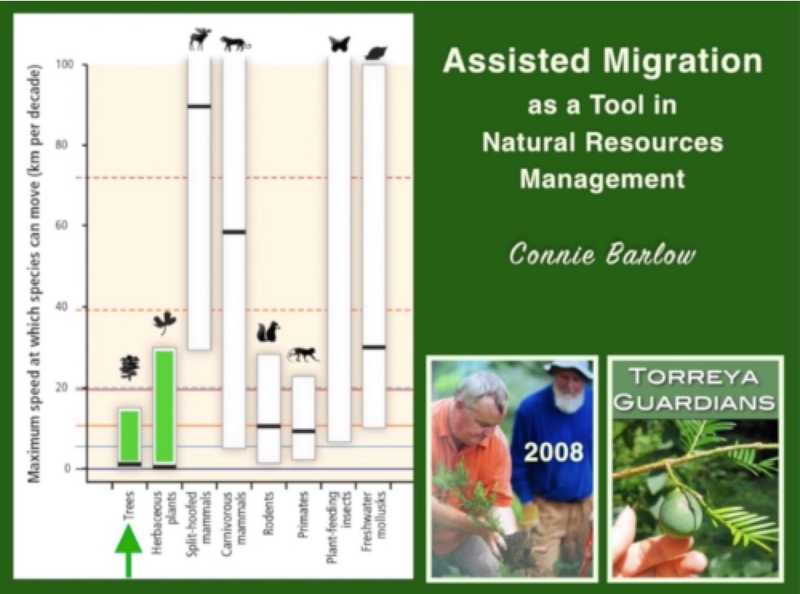 • Connie Barlow's 2015 TECHNICAL PRESENTATION ON 'ASSISTED MIGRATION' to the Forestry School at Michigan Tech University is titled Foresters Outpace Conservation Biologists in Climate Adaptation. 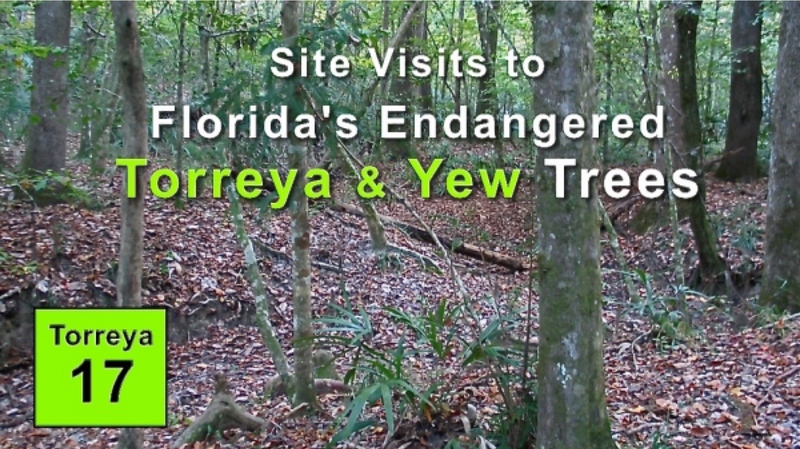 Site visit to Shoal Sanctuary, due west of Torreya's peak glacial refuge in northern Florida. Documentation of 9 seedlings thriving (and remarkably free of herbivory) four years after a total of 40 seeds were placed directly into the coolest, moistest habitats. Distinctions among the sites portend excellent learnings of site preferences in the years ahead. Site visit to Caroline Dormon Nature Preserve. 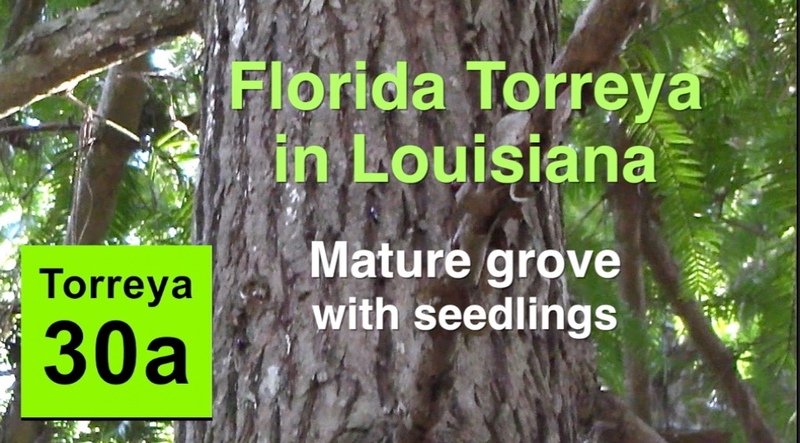 Of the four long-ago horticultural plantings outside of Florida that produce seeds that have germinated into seedlings nearby (with no human help), this mature grove of Florida Torreya in Louisiana is the first one in which knowledgeable local guides could provide the complete oral history and answer questions posed by Torreya Guardians. 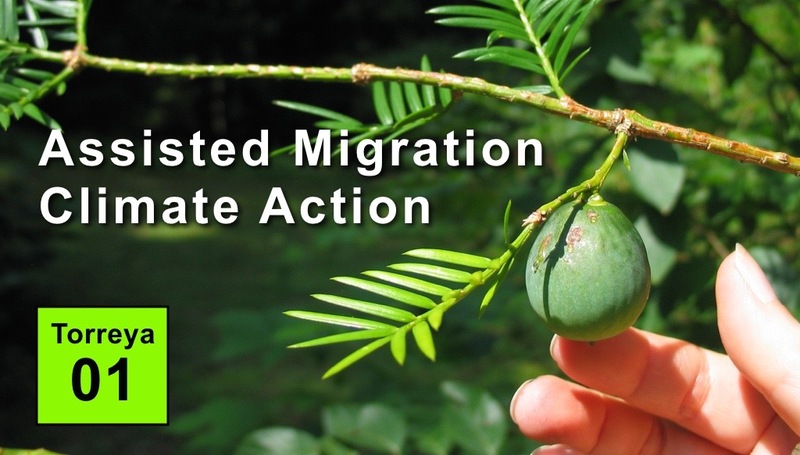 This is thus a superb example of why "natural history" observations and inquiry can help the development of best practices for "assisted migration" recovery actions to ensure that this climate-endangered tree does not slide into extinction. This last half of the video set covers the largest of the three mature trees  the only one that is producing any seeds. Nearby seedlings naturally established are featured, as is the 30-foot-long twin ground-trending branches that achieve photosynthesis by way of horizontal extension, well beyond what the 50-60 foot high canopy can provide. Ten years after the 2008 planting of ten potted seedlings as a first "assisted migration" project (reported on by Audubon Magazine), Connie Barlow returns to document ongoing results. The challenges, the successes, and the learnings are all topics covered here and also on the Lake Junaluska webpage. A key learning is how Torreya is capable of adapting its growth form to conditions of shade (horizontal, yew-like form) or abundant sunlight (standard conifer form). Field documentation of the 6 seedlings that grew and survived with zero human help, following "free-planting" of 15 seeds directly into forest soil in April 2015. Russ Regnery was the planter, within his forest at 3,800 feet elevation on the slope of Black Rock Mountain, near Franklin NC. Video clips of the 2015 planting (Episode 12) are matched with the actual seedlings closely photographed and analyzed Nov 2018. Results: Four summers later, this species exhibits remarkable capacities to recover from early stem and leaf herbivory. A multi-site, richly illustrated, and very detailed summary of overall results entail our new Free-Planting webpage. 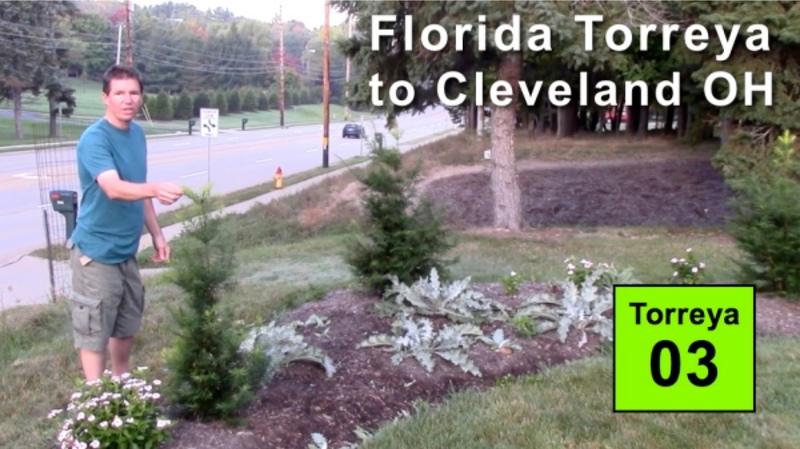 Torreya Guardians in Cleveland, Loveland (Cincinnati), and now Dayton Ohio are reporting early success with nurturing Torreya taxifolia in their forests. Florida Torreya has long been regarded as a "glacial relict." Considering that the "champion" Torreya tree is in a landscape planting in a cemetery south of Dayton, Ohio seems like a sure bet for doing well in today's climate and perhaps tolerating substantial warming in the decades ahead. Diana Spiegel (with assistance from Jim Spiegel) video-interviewed by Connie Barlow. Germination success in planting seeds directly into a rich forest habitat is show-cased during a field visit to our northern-most planter in Michigan (near Traverse City). Liana May is a professional botanist who, in April 2017 planted 100 seeds (from the fall 2016 harvest of Torreya taxifolia in Medford OR). She "free-planted" the seeds directly into the conservation easement on her 40 acres of forested property. Thankfully, by the time she received the seeds, other Torreya Guardians had confirmed an ideal way to foil rodent predation: plant the seeds 4 to 6 inches deep. Liana followed those directions, so we are expecting a satisfying proportion of the seeds to produce seedlings by fall of 2019. In 2005, Connie Barlow visited 4 forested regions in California where Torreya californica could be found growing in the wild. 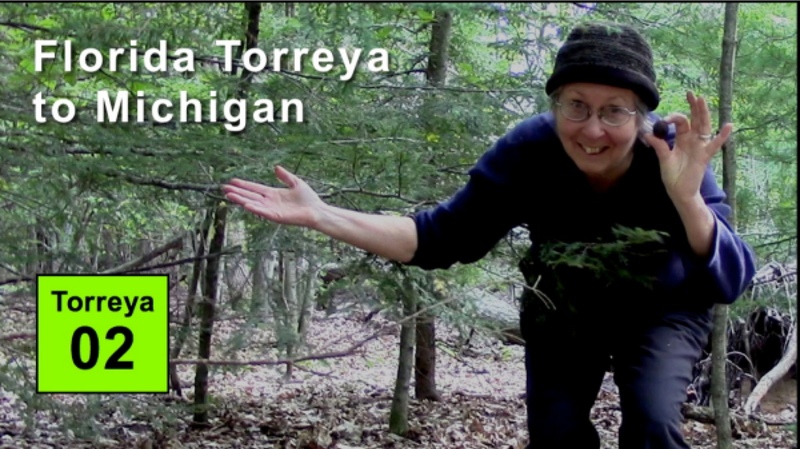 Her aim was to experience and photo-record observations of the trees and their surrounds such that volunteer planters of the Torreya species native to the eastern USA (along with professionals in charge of this endangered species' recovery) could discern habitat preferences of the genus and thus pinpoint similar environments in eastern states for planting seeds and seedlings. Read Connie's 2005 observational notes at: Photo-essays of California Torreyas. Frank Callahan transferred 1,000 seeds from the 2016 autumn harvest of Torreya taxifolia seeds  from two trees he had germinated from seed at an ex-situ planting (Medford, Oregon) some 22+ years earlier. He also shows two shrubby-form trees of Florida Torreya, about 22 years old. Significant discoveries: (a) rooted branchlets will not develop into single-stem trees and (b) Florida Torreya is harmed by sudden exposure to full-intensity sunlight, and even new leaves produced in direct sunlight may never adapt to sun-scald. 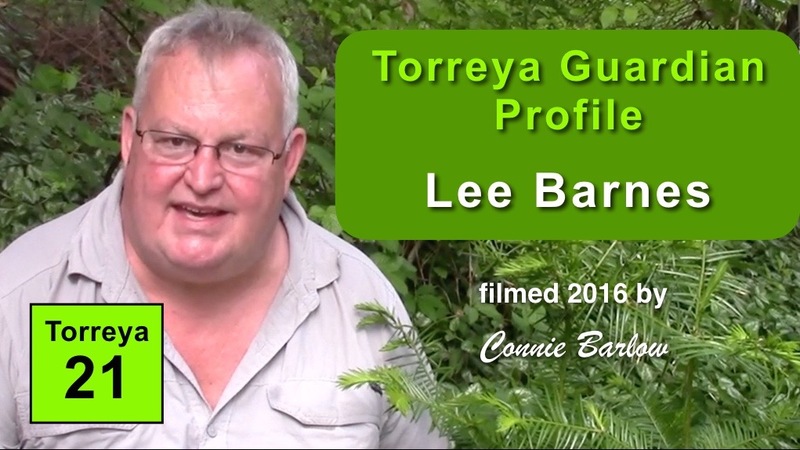 Lee Barnes is a founding Torreya Guardian, with the longest tenure of work with Torreya taxifolia. 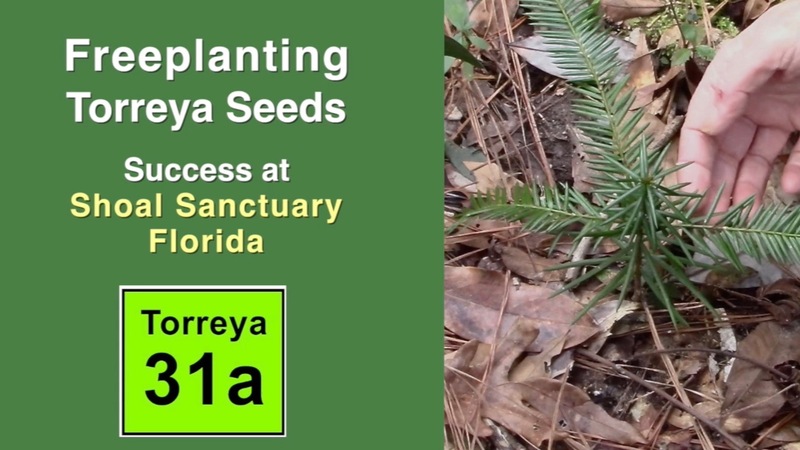 From 1981-85 his graduate research entailed advanced propagation techniques for three endangered plants in Torreya State Park of Florida  Torreya among them. Here Lee speaks of his research, his early role in securing Torreya seeds for distribution to volunteer planters, and his broader frame of biodiversity-centric life work. Lee confirms that North Carolina is excellent habitat for this Florida species  and that it is crucial to experiment with plantings much farther north as climate continues to change. Of the 5 remaining Torreyas planted in 2008 at the lower end of the garden, 2 were killed by rodents eating the tree roots overwinter 2015/16 and another is gravely injured in the same way. Both of the uninjured young trees are being dangerously encroached upon by rapidly expanding rhododendron patches. Connie Barlow narrates, with assistance by Michael Dowd. 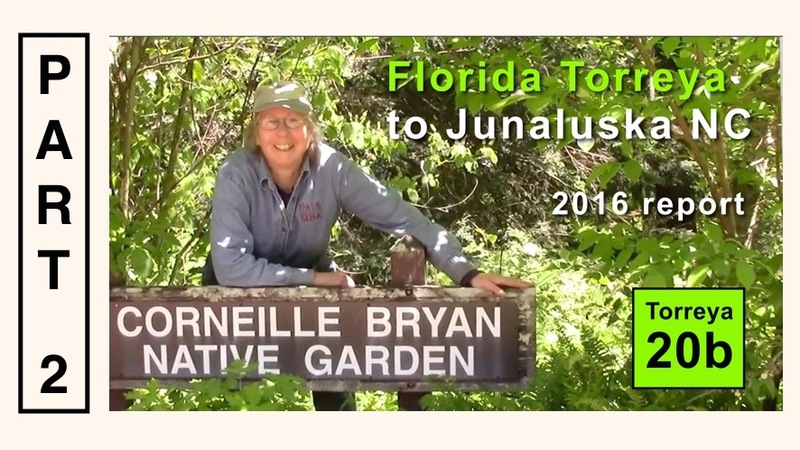 Note: This is a 2016 follow-up to 10b video filmed 2015 at Corneille Bryan Garden in Lake Junaluska, NC. Both trees planted in full sun (as potted seedlings) in the upper end of Corneille Bryan Garden in 2008 are continuing to excel  despite now being fully shaded by deciduous border and canopy. A key finding is that neither specimen produced vertical apical growth in 2015, but both are doing so in 2016. 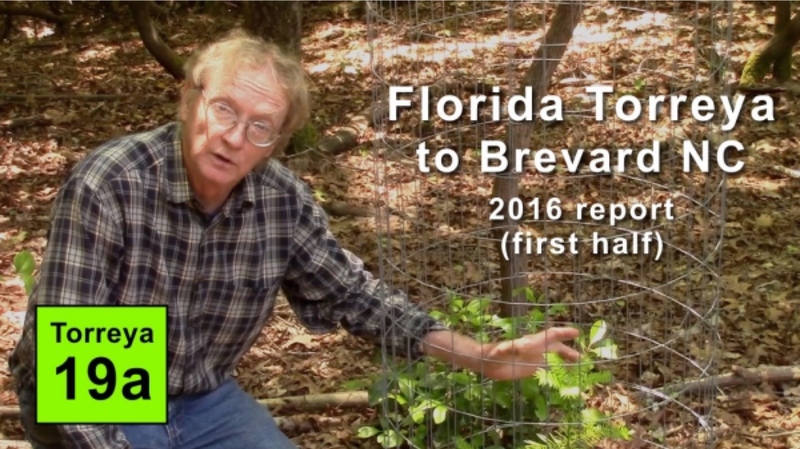 Buford Pruitt leads Connie Barlow on a video tour of his 17 Torreya taxifolia caged seedlings, planted in partial sun offered by his homesite edges in a regrowth forest near Brevard NC. Significant findings: Watch an "autopsy" of the one plant that died during the winter, and see evidence rodent predation of roots and lower bark. Learn how to assess plant vigor and important measurements to record. Notice the "basal sprouts" and why they should never be pruned back. Buford's trees are all from 2010, 2011, and 2012 Torreya Guardians seed harvests. The last half of Buford Pruitt's tour of his 16 still-living caged seedlings. Three apparently are planted on the compacted soil of an old logging road, and are struggling. Connie steers a discussion of the overall forest health: Why is there so little greenery on the forest floor? Pieced in are video segments of the lush greenery surrounding the original torreya plantings at the Waynesville site, 700 feet higher in elevation and on a far steeper (never cattle-grazed?) slope. 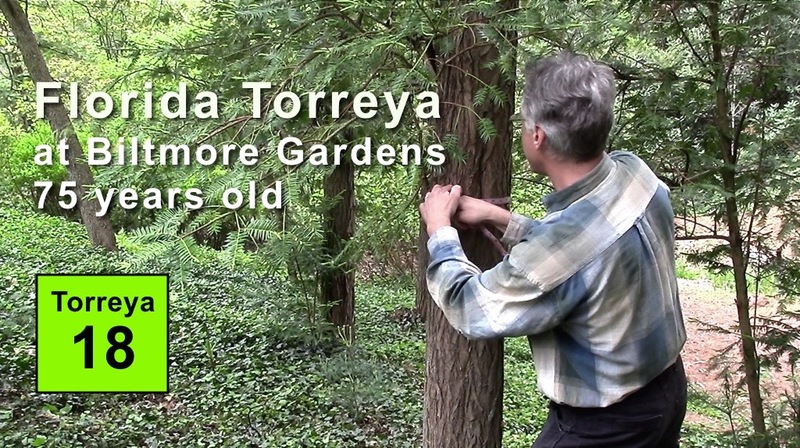 Overall, this 2-part series is a superb video for all new Torreya Guardians to watch  in order to help them assess their own properties for where best to plant seedlings. This wild forest site on Bob Miller's property NE of Cincinnati Ohio is rich in diverse habitats, notably a deep ravine in glacial till down to the limestone bedrock. This is the first video in which current species range maps are overlaid on sections depicting native trees onsite. A total of 56 seeds planted (seeds from the 2014 harvests). Documents progress in all 3 elements of this experiment led by Bob Miller: (1) free-planting of seeds (shallow burial, no protection) into wild regrowth forest; (2) shallow burial outdoors in a rodent/deer impenetrable exclosure; (3) planting into regrowth forest of two potted seedlings (one rodent-damaged). This wild forest site on Jim Thomson's property east of Cullowhee is the first location where Torreya Guardians have had access to a north-facing mountain slope. Here they will learn whether Florida Torreya thrives in this particular habitat of the southern Appalachians. Elevation 2,600 feet. Connie Barlow films and narrates this field survey, led by Jim Thomson. Here they observe the 4 Torreya taxifolia seedlings that Jim planted 18 months earlier from their pots. The original big-needled leaves are seen here to be dying back, but healthy shorter needles are the growth form that this cool, shady location seems to call forth. 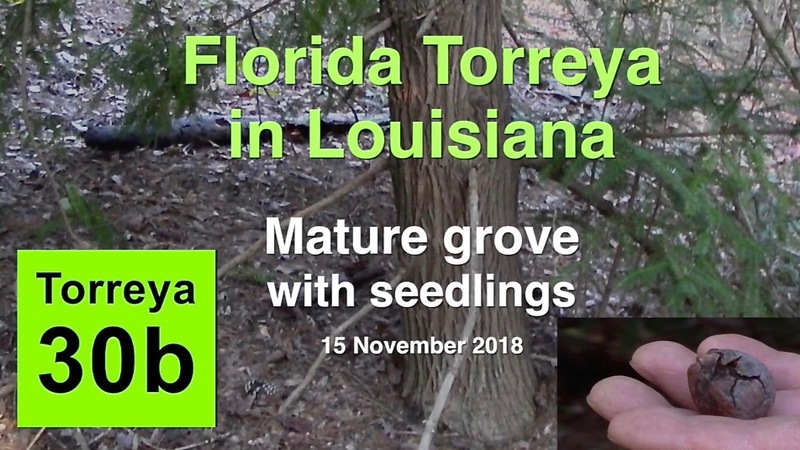 Jim Thomson, Lee Barnes, and Connie Barlow discuss what we all have learned thus far about how to germinate Florida Torreya seeds outdoors, in locales far north of the "historically native range" of this endangered conifer species. A lot is still unknown. But we do know that seeds harvested from the same mother tree in the same year will span a number of years to germinate, even when planted under the same conditions. 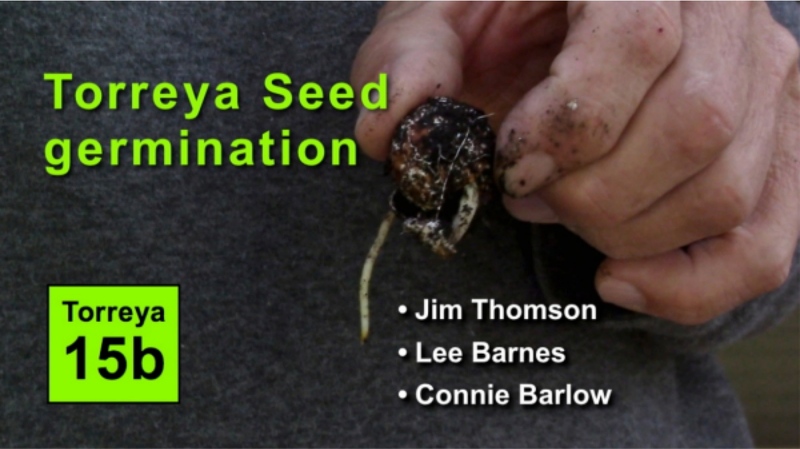 The final 5 minutes of the video are of Connie late June 2015, showing the varied germination rates of 4 seeds she is watching closely in a rodent-protected container in Ludington Michigan. 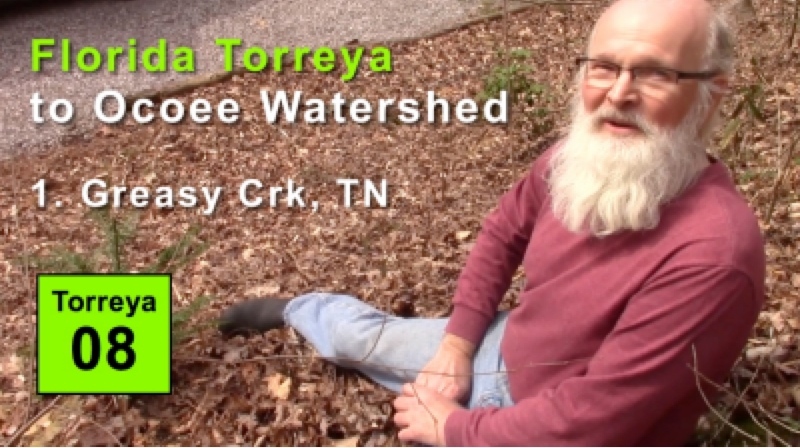 First video of best practices discovered by Torreya Guardians in attempting to plant seeds directly into the soil of wild forest in the southern Appalachian Mountains. This video chronicles Connie Barlow's visit to the site 17 months after planting. This video is superseded by later free-planting documentation in November 2018 (VIDEO 28) and January 2019 (VIDEO 31). Dawes Arboretum (Newark, Ohio) received ten seeds from Torreya Guardians from the 2006 harvest by Biltmore Gardens (Asheville, NC). Possible learnings are: (1) A full deciduous canopy of oak and maple seems to be superb habitat for Torreya in central Ohio. (2) Exposure to full sun and especially to polar winds seem to be very stressful to this genus. 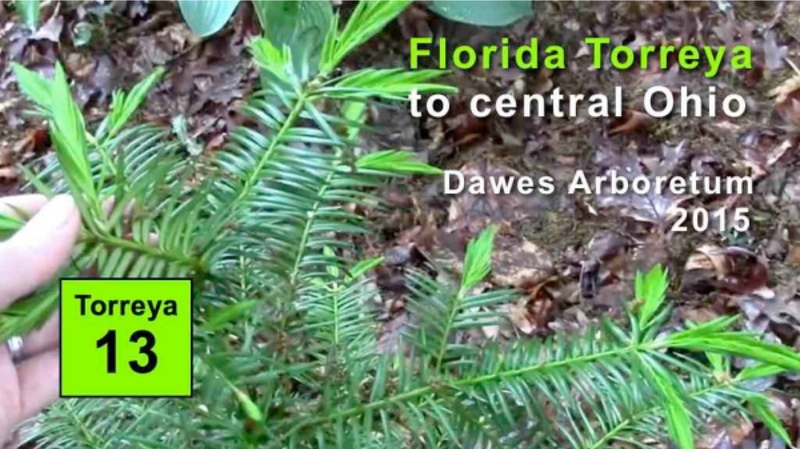 Video also compares Florida Torreya's leaf and branch morphology against two sister species native to Asia that have been planted in Dawes Arboretum: Torreya grandis (China) and Torreya nucifera (Japan). 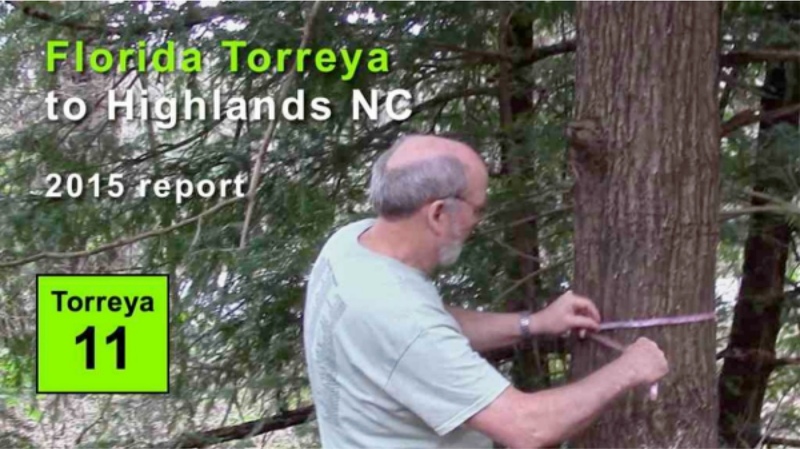 North Carolina was the destination of Torreya Guardians 2008 "rewilding" of Florida Torreya to its presumed ancestral home in pre-glacial warm times. Russ Regnery leads Connie Barlow on a tour of his young torreya trees 7 years later. Topics of discussion include (1) the advantage of sun-shading screen during the early years if Torreya is planted out in the open, (2) how Torreya is vulnerable to winter sun and wind scalding/dessication if not protected by a canopy, (3) the advantages of planting near nurse trees for shading and for sharing their symbiotic root fungi. 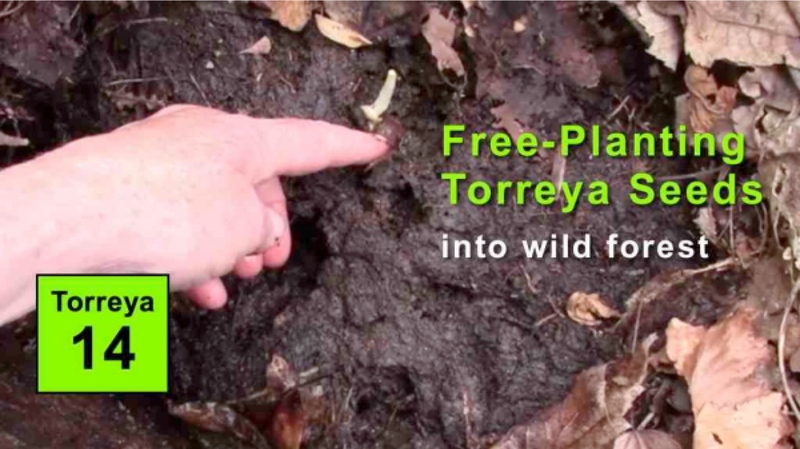 "Free-planting" seeds from the 2014 seed harvest directly beneath the forest canopy is the final half of the video. 32 minutes - filmed April 29, 2015. Scroll up to VIDEO 28 for October 2018 site visit documentation. 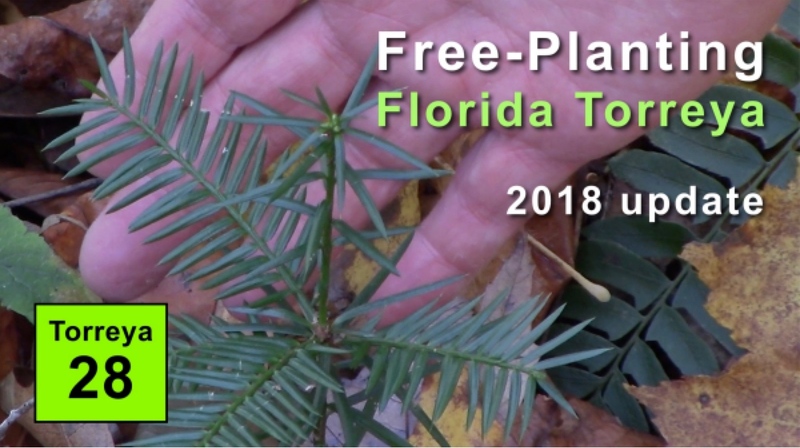 "Assisted migration" for climate-endangered Florida Torreya inadvertently began 90 years ago, when botanist Thomas Grant Harbison planted this conifer species on his mountainside land in Highlands, NC. April 2015, Torreya Guardians documented this gone-wild grove  likely, the best and oldest example of how this ancient native lineage grows beneath a deciduous canopy and its slow dispersal by squirrels. 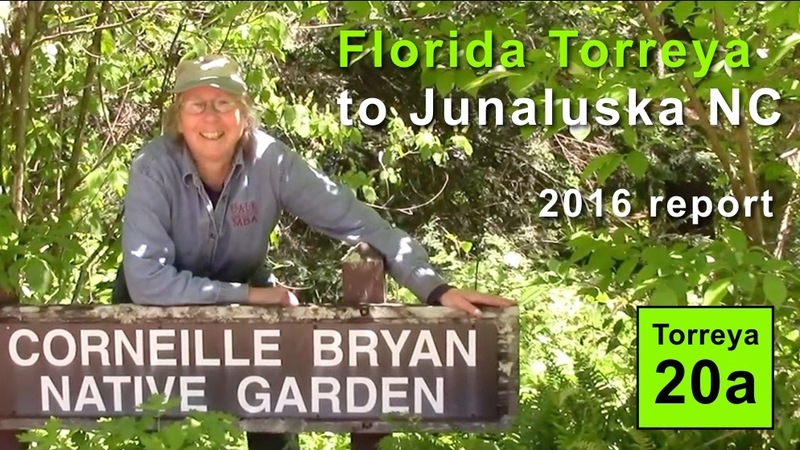 Connie Barlow narrates with camera; Jack Johnston explores and measures the Torreya grove and surrounding plants. UPDATE ON THE JUNALUSKA NC SITE: Scroll up to VIDEO 29 for the October 2018 site visit documentation. Thomas Mesko receives 43 Torreya taxifolia seeds from Connie Barlow, drawn from the 2014 harvest of Torreya Guardians. This video documents seeds being planted generally on north-facing slopes, between 1,600 and 1,800 feet elevation on Thomas's 50 acres of forested property along Wolf Creek, in the North Carolina section of the Ocoee Watershed. MARCH 2019 UPDATE: Site visit reveals that this set of shallow-planted seeds suffered 100% seed predation. This was an important learning, as only after the 2015 planting occurred did we ascertain that planting seeds 3 inches deep deterred rodent seed predators. Clint Bancroft shows Connie Barlow the 9 Florida Torreyas he has planted on his 18 acres in southeastern Tennessee (plus 2 more in pots). 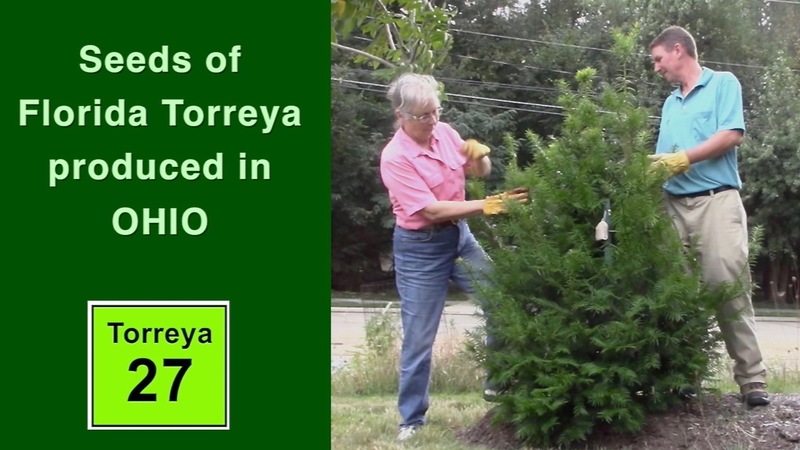 At 1,100 ft elevation, and in a mixed deciduous/conifer forest, all the Torreyas look healthy. In closing, Connie gives Clint 40 seeds from the fall 2014 Torreya Guardians' harvest. Clint demonstrates his rodent-proof outdoor shelter for germinating those seeds. 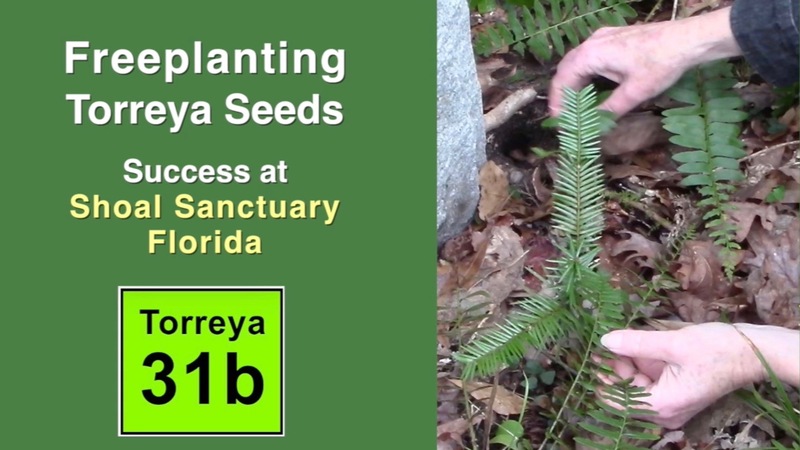 MARCH 2019 UPDATE: Site visit documents tremendous success of the outplanted seedlings recorded in this video (and germination of the 2015 donated seeds in protected pots). Video documentation will be posted later. Also refer to the Greasy Creek TN Torreya webpage for ongoing reports and photos. 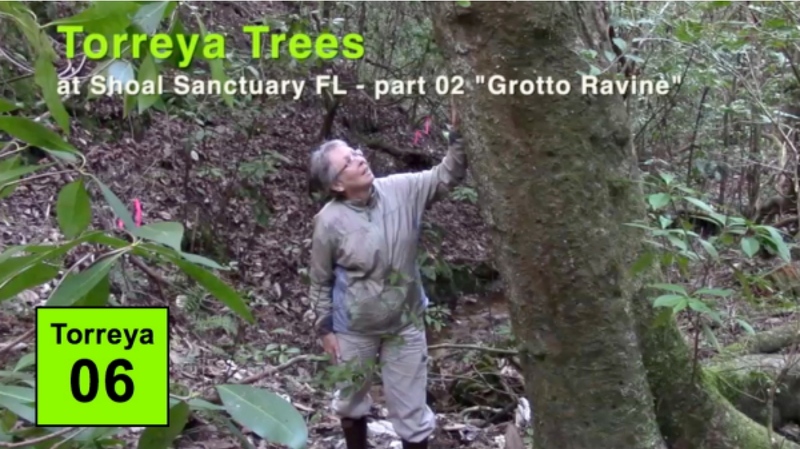 Connie Barlow identifies sites for 18 seeds of Torreya taxifolia to be planted in the moist, cool habitat of Grotto Ravine, within Shoal Sanctuary, Florida. Connie walks with camera through the ravine, speaking about why this spring-fed sandstone ravine in the Florida panhandle might be the best place for Florida Torreya to make a last stand in its home state. Clips of this video appear in the video documentation 4 years later (VIDEO 31, filmed onsite January 2019). 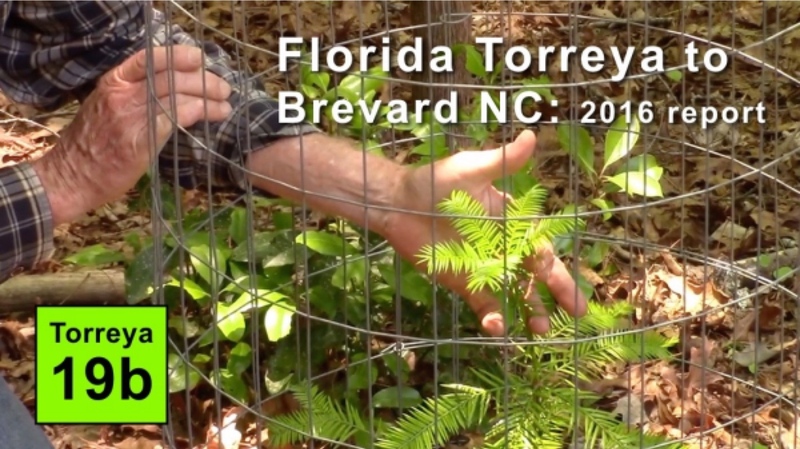 Chris Larson of Shoal Sanctuary, Florida, shows the four Torreya trees thriving since their planting in 2001. Of note: (1) only one tree has grown reproductive structures (male); (2) one survived a severe burn amid the longleaf pines; (3) all are thriving in nearly full sunlight on sandy soils; (4) agricultural lime is applied only rarely (when the evergreen leaves show yellowing); and (5) all four specimens are watered twice weekly. Fred Bess and Connie Barlow interview Secrest Arboretum's Paul Snyder re the successful germination of seeds from the 2011 seed harvest of Torreya Guardians. They discuss germination time, growth characteristics, preventing tree injury by overpopulated deer, and ultimately where in the arboretum the young trees will be planted. 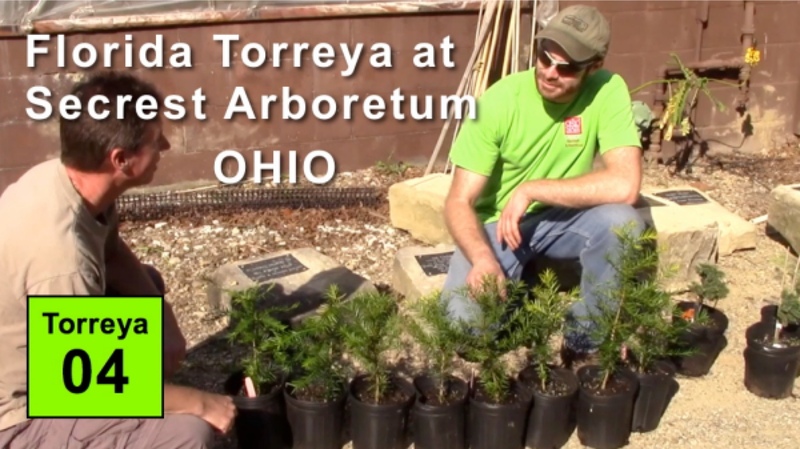 Fred Bess reports on 5 young Torreya trees planted at his home south of Cleveland, Ohio. Significant findings: (1) All 5 survived the -17F degrees polar vortex of January 2014. (2) Although deer do not eat Torreya, bucks scrape antlers on the stiff branches of juvenile plants, causing injury. Thus any Torreya planted in areas overpopulated with deer must protect young trees during autumn. WATCH VIDEO 27, filmed October 2018 to see how these trees have matured  and seeded! Consensus is growing that, of all trees native to the USA, "Florida" Torreya (an evergreen conifer related to yew trees) is the most in need of immediate assistance in moving north, as it was "left behind" in a peak glacial refugium since the end of the last ice advance. Given adequate seed stock, Connie Barlow decided it was crucial to discover just how far north in today's climate Torreya can grow. Here she documents an experiment. MICHIGAN UPDATE 2018: No seedlings visible in 4 years confirms that shallow seed-planting is food court for rodents. Visit Episode 25 to see another Michigan volunteer who showcases her seedlings  planted 4 to 6 inches deep. Note: This video is episode 08 in an ongoing video series by Barlow on forestry and climate adaptation. See an annotated list of titles and links to all such videos here: "CLIMATE, TREES, and LEGACY".